Chocolate Covered Cashews Recipe – Salty cashews covered in delicious chocolate and melted peanut butter chips with a pinch of chili powder. A bit of canola oil gets the chocolate and peanut butter all melty and delicious. If you are making sweet treats, you NEED to make these! So… having said that today I’m sharing one of my mom recipes AND Dan’s favorite treats! In fact when my folks visited at Christmas time, I was busy baking Easy Shortbread Cookies – Mom made a batch of these chocolates. They were tucked away in the fridge and we all dove into them during the holidays! My partner in crime and best friend Mom! But these little treats aren’t just for holidays and though I’m sharing them around Valentine’s Day, make these year-round. They are super easy and just that good. Truth be told I’m not much of a baker, and sweets really aren’t my thing. However Dan does and I like to make sure Dan has something to satisfy his sweet tooth. 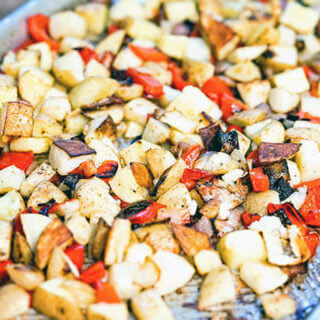 You’ll also need a pinch of chili powder and canola oil. Here’s how easy it comes together. 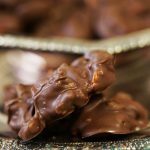 Here’s how easy these chocolates are to make! 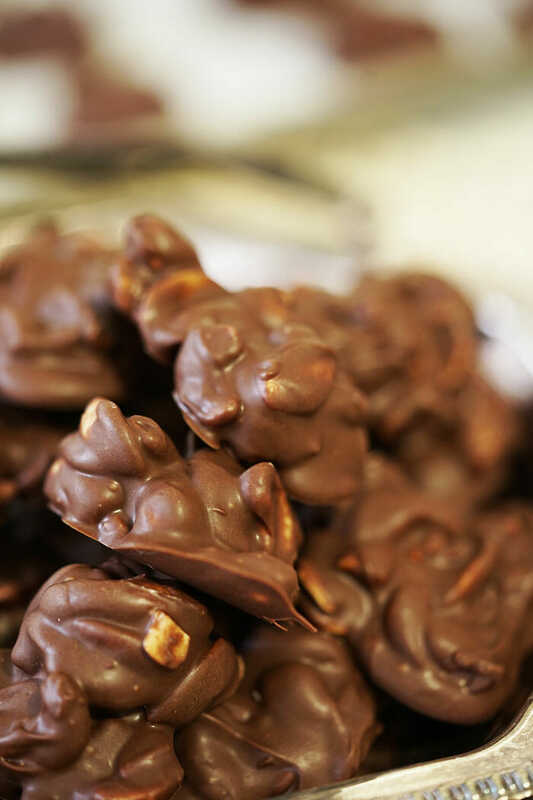 Chocolate Covered Cashew Recipe – easy to make! See how easy these are to make? They are a real treat too! Even with our diet, we are still enjoying a simple sweet treat in the evening. Do you like a sweet treat? Yes? Then I have just the treat for you! Here’s a funny story… when we got married Dan’s Mom wasn’t able to attend the wedding, but I knew she had a serious sweet tooth also. I made sure to pack up some cake and a couple of cupcakes from the wedding with instructions to Dan to drop it off. A week later I asked her what she thought of the cake? She said … cake, what cake? I sure would have like to have tried it but I didn’t get any! I looked at Dan and he was smiling like a Cheshire Cat…. I said Dan what happened to your Mom’s care package? He smiled and said I ate it! I know there are super fancy ways you’re supposed to make chocolate. Tempering to be sure it stays shiny and all that stuff. Here’s the deal – I think these look beautiful AND they only take minutes to make! Yep! This one checks off all of the important things on my list! 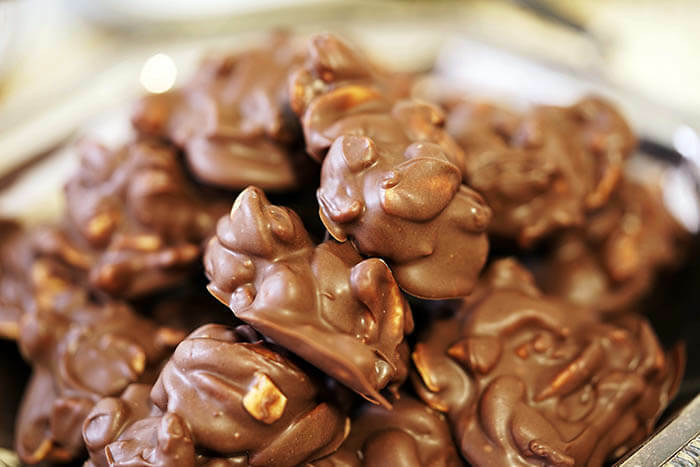 Salty cashews, melty chocolate and peanut butter morsels – yes, this is a match made in heaven! 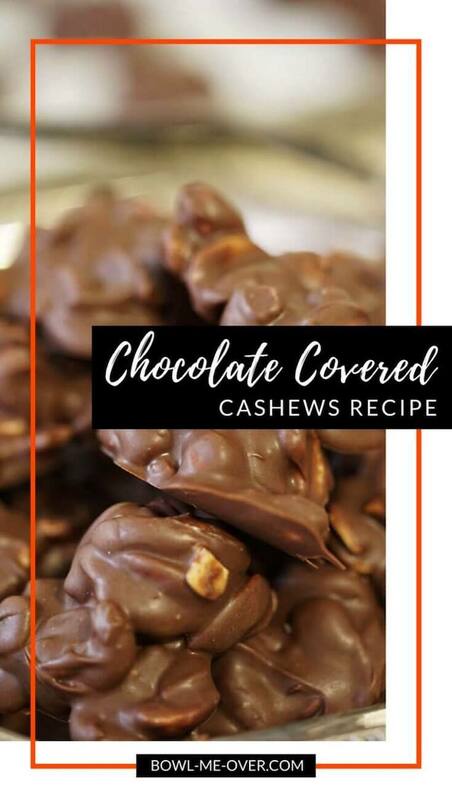 Do you love this Chocolate Covered Cashews Recipe? Be sure to comment below and give it a five star rating! 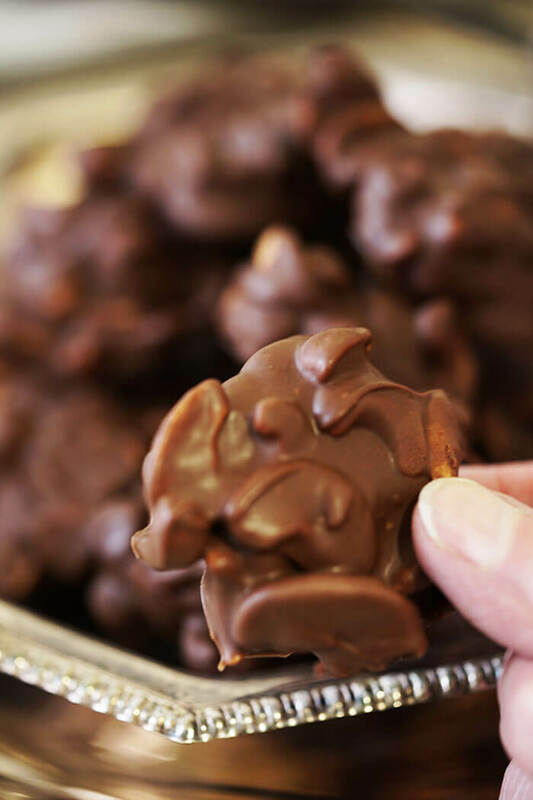 Chocolate Covered Cashews Recipe – Salty cashews covered in delicious chocolate and melted peanut butter chips with a pinch of chili powder. A bit of canola oil gets the chocolate and peanut butter all melty and delicious!!! 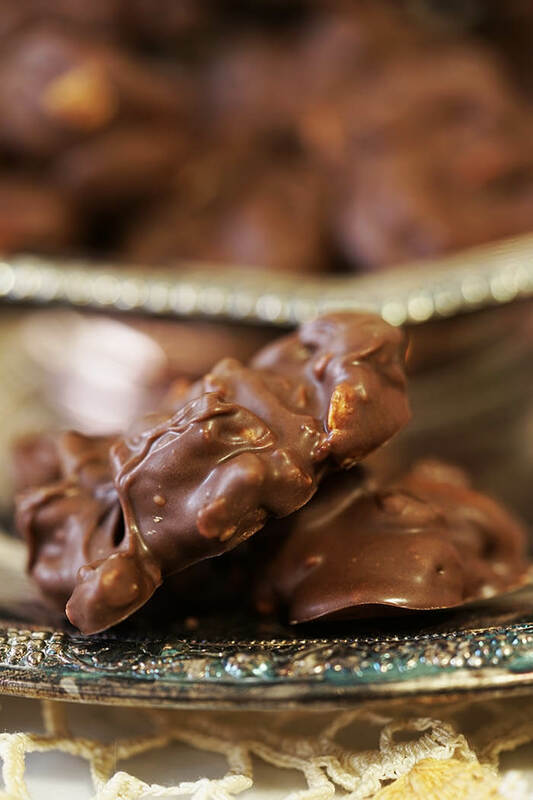 Chocolate Covered Cashews Recipe - Salty cashews are covered in rich delicious chocolate and melted peanut butter chips with just a pinch of chili powder. A bit of canola oil gets the chocolate and peanut butter all melty and delicious. 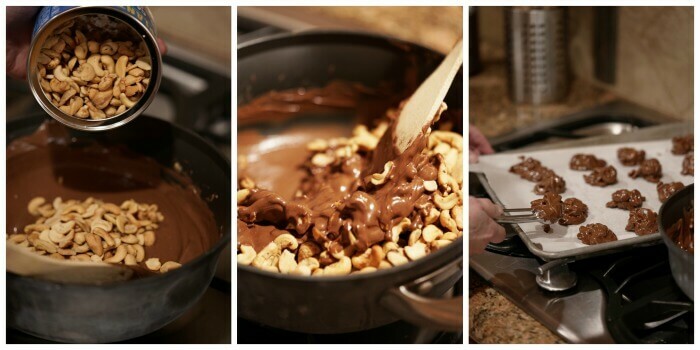 Add the chocolate and peanut butter morsels to a heavy bottom pan on the stove. Place it over medium/medium low heat, stirring the entire time. Add the canola oil and chili powder. Melt the chocolate, continue stirring. Using a small ice cream scoop, scoop them onto a cookie sheet lined with parchment paper. Refrigerate immediately for at least one hour to allow them to harden. Store in the refrigerator or freezer. These freeze great - wrap them individually in plastic and freeze. Strawberry Shortcake Brownies – this one ties all of my favorites together into one amazing dessert! This is a delicious show stopping dessert! 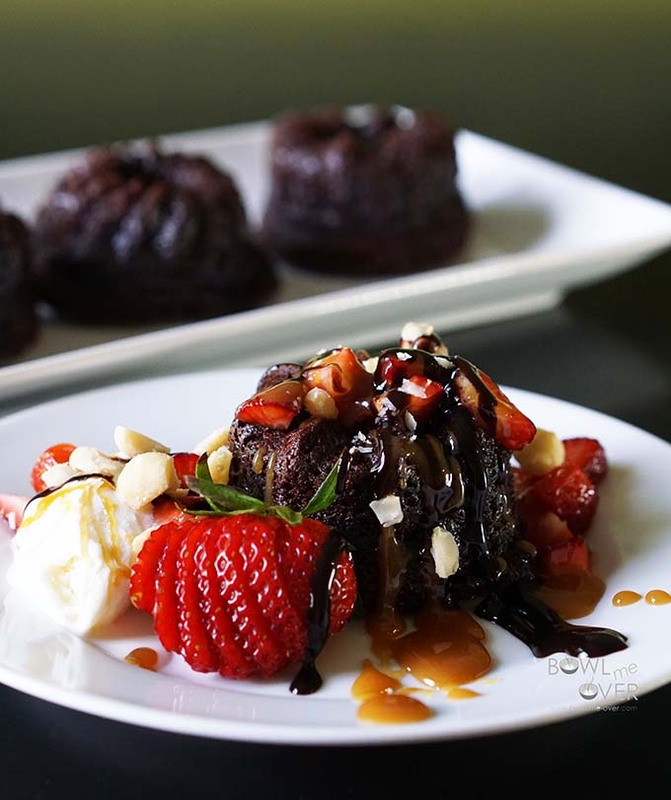 Strawberry Shortcake Brownies – Brownies drizzled with caramel and hot fudge topped with sliced strawberries and macadamia nuts and of course there HAS to be ice-cream! 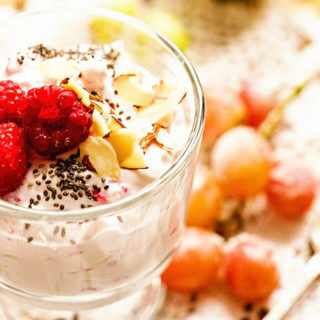 This might seem time-consuming, but it’s a delicious dessert that takes some quick and easy shortcuts! Grandma Bertha’s Butter Cookies! 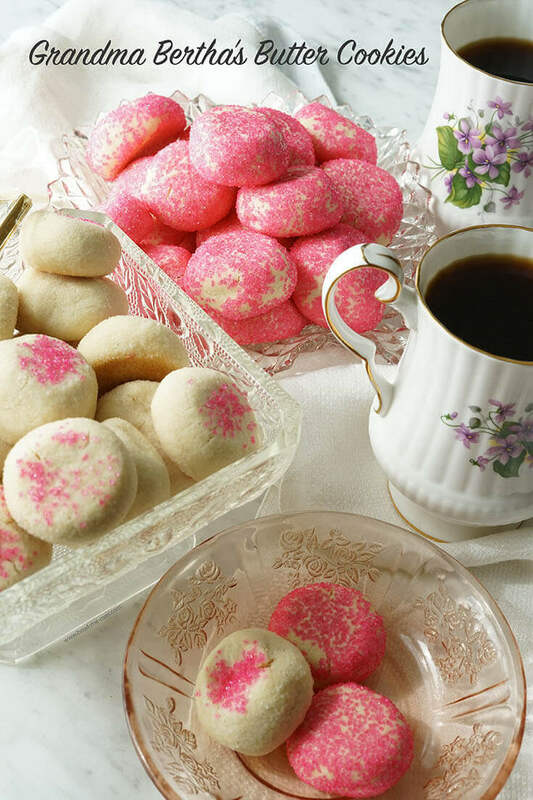 This tried and true family recipe is an excellent cookie to enjoy with coffee or tea! Butter cookies are super easy to make! This is a tried and true recipe that has been in Dan’s family for years! 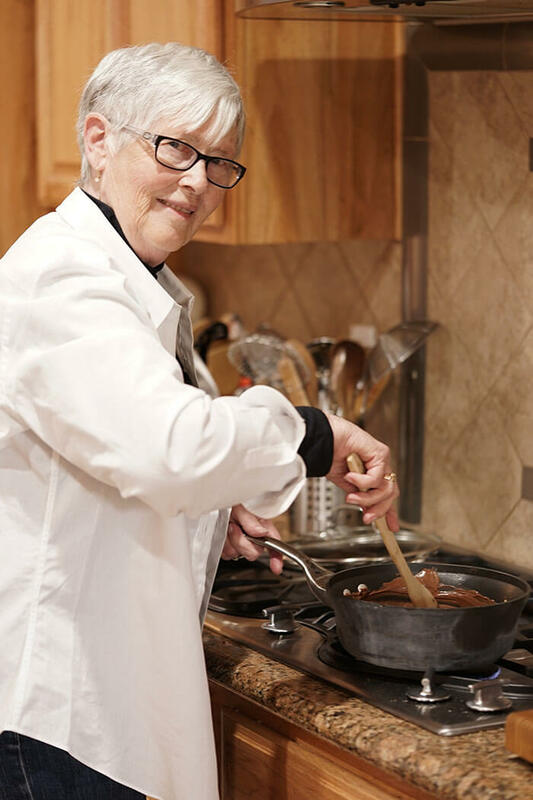 His Grandma Bertha was quite the cook and I’m so proud to have this recipe on the blog. Make a batch of cookies for your sweetie! Strawberry Lemon Parfait – only 4 ingredients just 15 minutes to make! 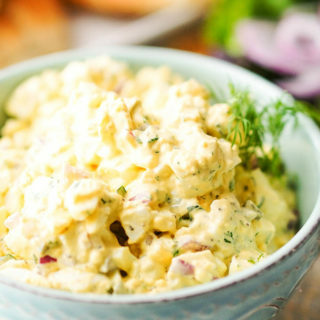 Perfect for picnic & heavenly enough for a dinner party. 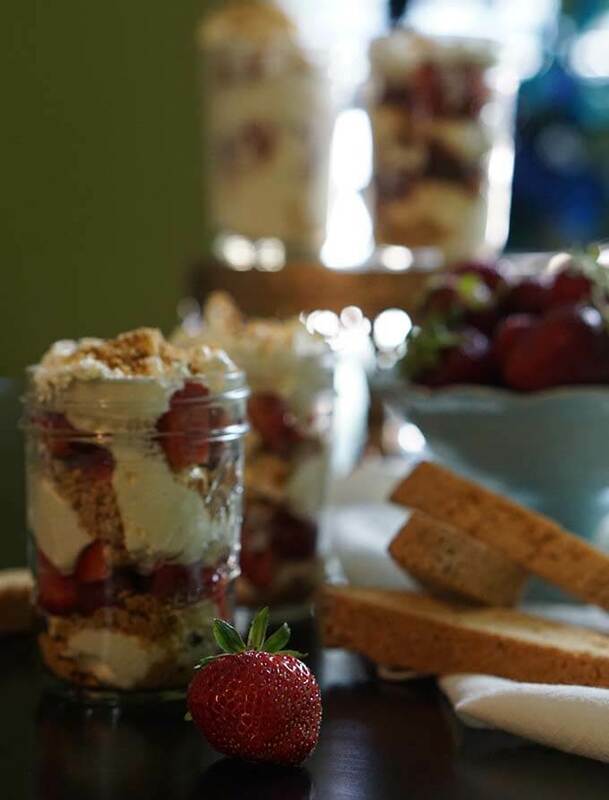 Ok… one more sweet treat for you to consider – Strawberry Lemon Parfait – sweet strawberries, lemon curd mixed with homemade whipped cream and biscotti cookies are layered into your favorite serving dish and make an easy, delicious dessert! I just made them again this morning and they are soooo good. Love them and so easy. Haha! I just made more today too mom – this recipe is well tested! 😉 Thank you again for a lovely recipe!!! This would make a fabulous Valentine’s (or anytime) treat. We are huge chocolate covered nuts fans! Us too Sandi! 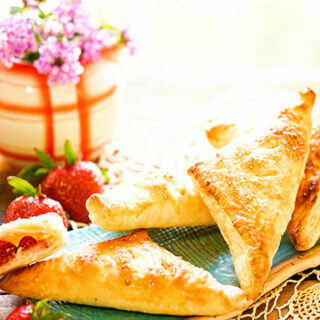 These are so yummy we just love this sweet treat! Thank you Angela! My Mom is so pretty and when my folks visit we always have the best time!! Enjoy this recipe! I love family recipes…. they always seem to work better becasue of the the history of them. I will definitely be making these…. Im kind of loving they have a little chili powder in them, which makes them different than most recipes Ive tried! Love it! Thanks Michele! That chili powder doesn’t light them up in any way but really just enhances the chocolate flavor – yum!!! Nice job on the weight loss and I’m with you about keeping on track by keeping a balance to include tasty treats! These totally hit my sweet tooth with crunchy nuts made with both Chocolate and peanut butter chips?! Heavenly! Thanks Sandra we’ve been working hard and making better choices! Glad I’m not crazy thinking I need a treat every now and then! 😀 Heavenly is a great way to describe these delicious chocolates. Enjoy! I love treats like this one. Easy to put together and mother approved! You are smart enjoying a treat now and then. Life is a balance! Can’t any better than Mom made and approved! 😀 Thanks Julie, I appreciate you stopping by! Love the photo of your mom! I alway make chocolate covered peanuts. I am going to have to try these!! Thank you Michaela – Mom is my best buddy and pal!!! I can’t wait for you to try this recipe, I know you’ll love it! What a tasty snack! I love that this is a family recipe too! Thanks Madi – I hope you give these yummy bites a try! 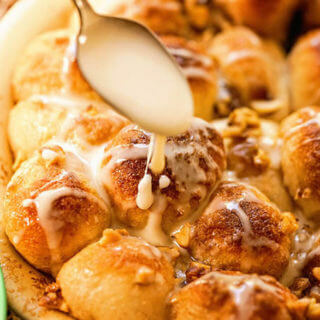 These look delicious and easy to make! Cashews are one of my favorite nuts too! 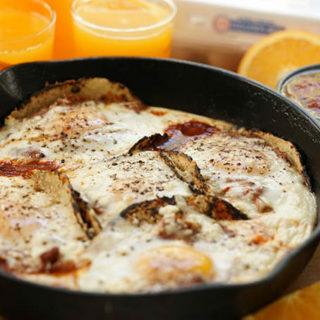 Thanks for this impressive and easy recipe! I’m so happy you enjoy this recipe! Love that it’s easy too and sharing my Mom’s recipe makes it that much better. Thanks Debi!